The author served as a missionary in the Philippines and now lives in Virginia, USA. “Jesus saith unto him, Feed my sheep” (John 21:17). Jared walked home from church in the hot sunshine with Mom and Dad. He thought about his Primary lesson. Since he couldn’t hear very well, Jared had to pay close attention to the pictures his teacher showed and the words she wrote on the board. That day they had learned that Jesus asked the disciples to be missionaries. Jared wondered what he could do to share the gospel, like Jesus asked. He knew he couldn’t serve a mission yet. Then he had a great idea. Maybe he could start saving money for it! When he got home, Jared ran right past Umber, his pet goat, and into the house. He got a big plastic jar and carefully cut a hole in the top. He wrote “Mission Fund” on the side. Then he went to his room and got his money from under his bed. One by one he dropped in each coin. But all his coins barely covered the bottom of the jar. How could he earn more money? Jared thought and thought. He looked out the window at the bright sun. It was so hot in the Philippines. Jared and his friends ate coconut ice candy almost every afternoon after school. “That’s it!” he thought. Maybe he could make ice candy and sell it to other people who wanted to cool down. Jared ran to find Mom. “Can you show me how to make ice candy?” Jared signed. They used sign language, a language where you talk with your hands. Mom smiled and nodded. The next day, Jared and Mom walked to the big outdoor market and bought all the supplies. When they got home, Jared took out a big bowl and mixed coconut milk, condensed milk, vanilla, and shredded coconut. Mom and Jared used a funnel to pour the mix into small bags. They put all the bags in the freezer. “Great job!” Mom signed. The ice candy took a long time to freeze. But the next day after school, it was finally ready! Jared climbed on a chair and got the white cooler off the top of the fridge. He put some towels in the bottom of the cooler and layered the ice candy on top. He couldn’t wait to sell it. Jared ran outside into the dusty street. His friends were playing with homemade kites and throwing their flip-flops at a tin can to knock it over. At the side of the road, he set up a table with a big sign that said, “Ice Candy, 5 pesos.” His friend Jhonell ran over and pointed at the cooler. He gave Jared a five-peso coin, and Jared gave him some ice candy. They high-fived. Soon more of Jared’s friends came to buy ice candy too. A few hours later when Mom called Jared for dinner, there were only a few ice candies left. Jared picked up the almost-empty cooler and the coins. In one of his pockets, he put some of the coins for his tithing. He put the rest of the coins into his other pocket. He couldn’t wait to see his mission-fund bank fill up. 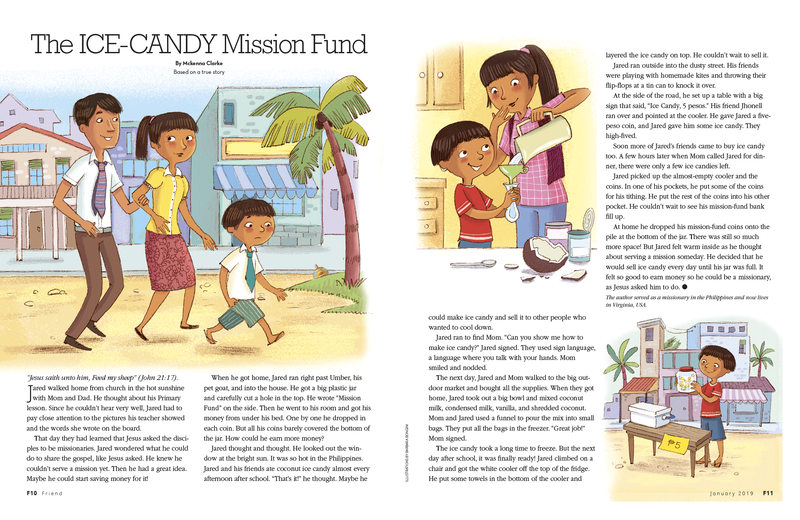 At home he dropped his mission-fund coins onto the pile at the bottom of the jar. There was still so much more space! But Jared felt warm inside as he thought about serving a mission someday. He decided that he would sell ice candy every day until his jar was full. It felt so good to earn money so he could be a missionary as Jesus asked him to do.